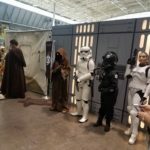 Recent Boston Comic Con, One in Manchester is soon. 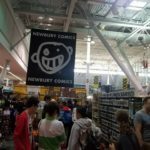 Here is a Story of the Boston Comic Con that recently happened. It was held in the Boston Convention Center near East Boston. It was sooo busy that police had to direct traffic and direct people to parking spaces. People came there dressed as characters, like Harley Quinn from Suicide Squad (I saw that costume a lot), Doctor Octopus from Spider-man 2, Joker, Deadpool, Star Wars characters, Spider-man etc etc. I Forgot to dress up as I rushed to get there for parking. The Comic Con featured celebrities to sign their auto graphs and have selfies with. Like Jim Cummings who has played many Disney characters, Billy West who played Stimpy on Ren and Stimpy and was in Futurama, Anthony Daniels who was 3CPO and they had a 3CPO Robot in his booth. On my Facebook I made a live video of it. They had much of the Rocky Horror Picture show cast there. Like they had Barry Bostwick who played Brad the hero, Susan Sarandon who played Janet Weiss, Patricia Quinn who played Magenta. 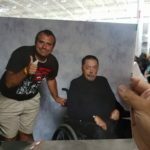 Tim Curry (Who played Frank N Furter in the movie, as well as Pennywise the Clown, Long John Silver from Muppet Treasure Island and villains in Peter Pan and the Pirates, Darkwing Duck, Mighty Ducks, The Mask animated series etc) was there but in a wheel chair as he had a stroke. It cost me $120 to have a photo opp w him and they printed a photo of him. It cost more to have a photo opp of the Whole Rocky Horror Picture show cast. 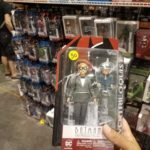 In addition they had Stan Lee’s last East Coast appearance and people sign his auto graphs. A friend of mine had her son sign his autograph. Sad how I never got that chance. OH, they had Star Wars moving displays that were popular. They had displays of merchandise. Of Course they had to raise the prices due to the event and the businesses splitting costs as ya have to make more than breaking even in business. In addition the event was so jammed packed it was bottle necking. 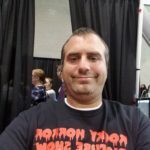 the Manchester NH Granite State Comic Con is Sept 15 to 17 here http://www.granitecon.com/ and it’s at Radisson Inn. It’s a smaller version of the Comic Con I covered. ← Laconia’s 125th Event thats today!